I’ve been driving on Hwy 101 literally my entire life. My family is from Meteghan River which is almost as south as you can get in Nova Scotia. Completely unaware this entire time I’ve been driving by a little hidden gem of a restaurant. Antonio’s Italian & Canadian Cuisine can be found right off Hwy 101 just after the Digby exit (coming from Halifax) They’ve been in business for 22 years (so literally I’ve been passing this place almost all my life) and it’s owners are the only cook and server in the place. Coming home from a long weekend my boyfriend and I found ourselves starving around 3pm and just happened to see the fish and chips sign on the side of the road… So we decided to stop! Full disclosure: it looks like a hole in the wall when you first get there BUT within seconds of arriving we were welcomed by the owners, and were just made to feel so at home! You can tell they invest in their service and their food as opposed to the décor but I’m perfectly ok with that. Known for their FRESH fish and chips that's exactly what we ordered and it was amazing, the batter on the fish was incredibly light and flaky. Portions were large and price was great. They've been in business for many years and the pride this couple has for their restaurant is amazing. I even had a conversation with the cook about his recent potato order. You need to stop here, it’s worth it if you’re in the area! You’ll feel so at home. They have a great reputation on Trip Advisor, some amazing reviews and photos can be found there. If you do end up there, make sure you give them a great review. They will really appreciate it! I also wanted to take a little space to showcase one of my cakes this week. 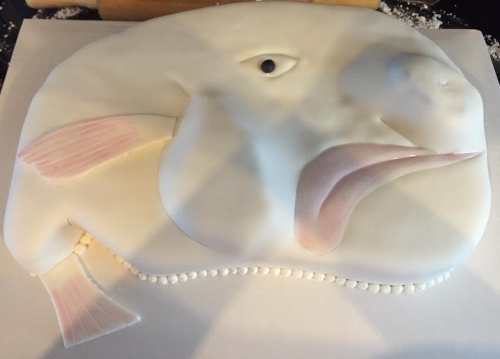 With the theme of fish and chips here is a blob fish birthday cake! Said to be the ugliest fish in the sea!